James Tynion IV is the writer of the New York Times Best-Selling BATMAN/TEENAGE MUTANT NINJA TURTLES cross-over for DC Comics and IDW Publishing, as well as the bi-weekly DETECTIVE COMICS, a key title in DC Comics' Rebirth initiative. He lives and works with his dog and partner in Brooklyn, NY. Magic is being eaten alive by a cosmic terror known as THE UPSIDE DOWN MAN, and WONDER WOMAN is desperate to pull together the magical world's greatest heroes in order to stop it. Zatanna, Swamp Thing, Detective Chimp, and Man Bat must learn the secret history of magic in the DC Universe in order to save it, but with far more powerful forces at work, there may not be any hope! Monthly from DC Comics, with art by Alvaro Martinez, Raul Fernandez and Brad Anderson. The Justice League has returned to the Hall of Justice, and opposing them are their greatest villains, THE LEGION OF DOOM. James is assisting Scott Snyder on his epic JUSTICE LEAGUE run that will redefine the rules of the DC Multiverse, handling the story from the villains' perspective. 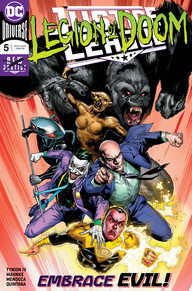 Featuring the likes of Lex Luthor, Joker, Black Manta, Cheetah, and Gorilla Grodd, these stories show the darkest corners of DC and the secret actions taken by Lex Luthor as he works to ensure Doom wins over Justice once and for all! This is where you can keep track of the next Conventions and Signings you'll be able to find James Tynion IV, across the United States and beyond. If you are interested in James appearing at your next convention, please use the contact form at the bottom of the page and reach out! May 3-5th in Dallas, TX! James will be signing with Comic Sketch Art all days of the convention. Follow James on Twitter for signing information. May 16-19th in Orlando, FL! James will be signing with Comic Sketch Art all days of the convention. Follow James on Twitter for signing information. July 17-23rd in San Diego, CA! James will be appearing all days of the convention. Follow James on Twitter for signing information as we get closer to the convention! James will be appearing at the following shows in 2019. Stay tuned for more announcements about when and where he might be going next. You can reach James regarding Convention Appearances, Store Signings, and General Inquiries using this form. If you are looking to inquire about interviewing James about his DC Comics or Boom! Studios projects for your website or podcast, please reach out to the Press Department of the respective company to set them up, as he will not be able to commit without their involvement. Due to a heavy workload, James is not able to participate in school projects at this time.